At guild meeting in january a member brought in several upholstery samples she was gifted as cotton fabric. She was trying to get rid of them. So a challenge was issued. Each membercwas to take 6-8 and make something from them to be shown in march. I saw somewhere on a blog while browsing about a shag rag. I for the life of me I cant find it now to give proper credit but I am working from another tutorial on Internet for shag pillow which is same method she used. Well half of my shag rug is done. Now I am working on the other half. When I am done and have shown the guild then I will use the rug for the entranceway into my new studio. What a fun challenge! Good job! 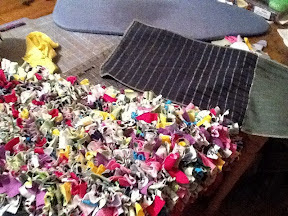 Its awesome, I have a bunch scraps too from a friend, please share a tutorial and the finished product. its great, Thanks for stopping by my blog today and good luck with the giveaway..